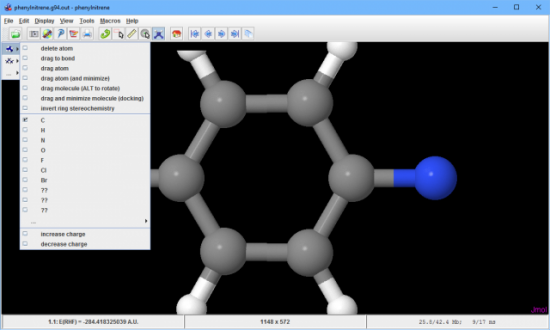 Let's dig back into some chemistry software to see what kind of work you can do on your Linux machine. Specifically, let's look at Jmol, a Java application that is available as both a desktop application and a web-based applet. You can use Jmol to help analyze the results you get from other software packages that actually calculate the chemical effects you are researching. It can read in dozens of different file formats, and you can use it to visualize everything from small molecules to huge macromolecules, like proteins. You also can visualize crystals and orbitals. You even can visualize animated events, such as chemical reactions and molecular vibrations. If you want to use the latest and greatest version, download it from the main project website. The download comes as a simple zip file containing everything you need to run Jmol. You also will need to install a Java virtual machine in order to run Jmol. If you installed Jmol from the package manager, you probably will have a script available that will make running Jmol easier. If you install it from the binary zip file, you will need to run it manually by calling Java and using the JAR file as a command-line option. 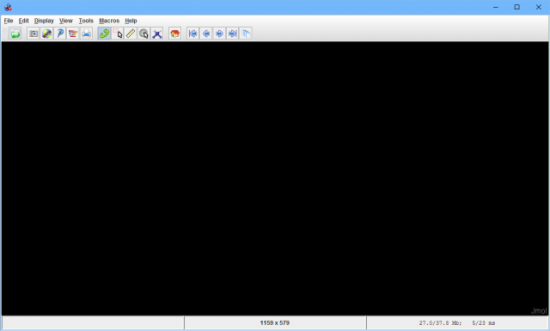 When you first start Jmol, you'll see a blank screen, ready for input. Across the top is a series of icons allowing for easy access to the key functions available within Jmol. If you already have data files to analyze, you can use them. Otherwise, you may need some sample files in order to play with the functionality available. Figure 1. When you first start Jmol, you get a blank workspace ready for your work. The binary distribution doesn't include any sample files in order to save on download bandwidth; however, several sample data files are available from the main website. You can get the entire set by downloading a snapshot of the source files. In the examples for the rest of this article, I'm using several of the sample data files available from the source snapshot download. The simplest example is just to load a data file and see what it looks like. Figure 2 shows what you get when you load the sample file Jmol-datafiles/gaussian/phenylnitrine.g94.out. Figure 2. The basic display you get when you load a molecule is a ball and stick display. The data display is an interactive one. Using your mouse, you can click and drag the molecule to rotate it around to see all of the details. The Display menu item provides a number of options to play with the molecule. The Atom menu item allows you to change how much of the van der Waals force field to show. The Bond menu item shows how thick to make the bonds between atoms. With these two options, you can tailor the display so that the appropriate amount of detail is shown. The Label menu item allows you to add either symbols, names or atomic numbers to the atoms within the molecule. Near the bottom of the Display menu, there is a check box for whether hydrogen atoms are displayed within the display of the molecule. While I'm talking about how to affect the display of the molecule, I should mention that the View menu item provides a number of presets on how to line up the molecule. 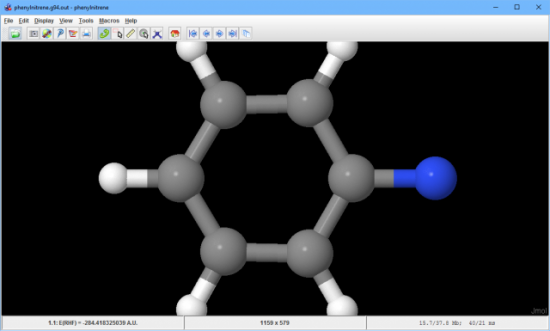 So, with a single click, you can view the molecule along any of its axes. Jmol also can display animations of events, along with static images. The animations subdirectory contains several examples that you can play with. When you load it up, you start with a static image of the molecule as before. Figure 3. When you load an animation, it starts with a static image of your molecule. Within the icon bar at the top of the window, there are a series of buttons at the far right-hand side that allow you to step through the frames of the animation frame by frame. If you want to see the full animation, there's set of options under the Tools→Animate menu item. Here, you can go through the animation once, or you can put it on a loop. You can even use a mode called Palindrome that goes forward through the animation and then backward. That way, you need to calculate only one half of the motion, yet you still are able to visualize the entire range of the motion. Several more analysis tools are available. Clicking the Tools→Spectra→JSpecView menu item pops up a new window. Under the File menu item, you'll find options to add extra files, or do H1 or C13 simulations. You can select Tools→Measurements to measure the distance between atoms within your molecule, and you can set the units used for those measurements with the Tools→Distance Units menu item. You actually can edit the molecule after it is loaded too. Figure 4. 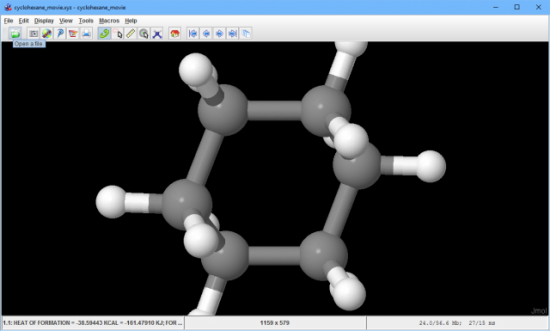 JSpecView is an extra tool available for looking at the spectra of molecules. If you click the icon button with the hover-over description "Open the model kit", you'll get a small set of drop-down items on the top left side of the display window. It allows you to delete atoms, move bonds around or even change the atom species at specific locations. Figure 5. Jmol also lets you edit molecules. If you have some type of analysis that you need to repeat several times, Jmol supports the addition of macros. Macros are just simple text files that contain a set of Jmol instructions. If you save them in the ~/.jmol/macros directory, Jmol will pick them up and provide them within the Macros menu item. The language for the macros is the same used for Jmol's scripting capabilities. This scripting language is based on of RasMol, with some minor changes. There is a full language reference available here. 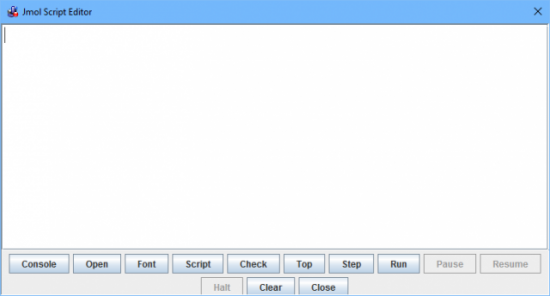 You also can use scripts interactively by clicking the File→Script Editor menu item. This pops up a new window where you can write your script, check its syntax and then run it within Jmol. This provides a huge amount of power, allowing you to get the exact type of analysis you need. Figure 6. Jmol provides a full scripting language to help automate your analysis steps. Once you've done your analysis, several output options are available. The File→Export menu item gives you four options. You can select Export Image to save a static image in one of several image file formats. Because Jmol also operates as a Java applet, you can select Export to Web Page to generate a web page that you then can use within your own website to share your research results. If you want a higher-resolution image of a molecule, you can select Render in POV-Ray to use the POV-Ray external program to render a high quality 3D image. The last export option is Write State, which saves the current workspace so that you can reload it later and continue your analysis. There also is an extra output option under Tools→Gaussian that pops up another window. 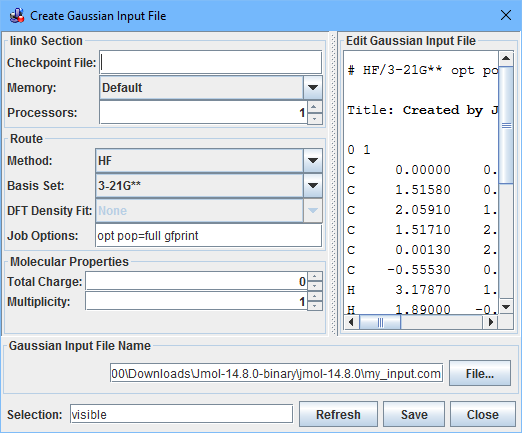 Here you can set several options for a Gaussian input file that you can then use to run further simulations of your molecule. Figure 7. You can use Jmol to generate Gaussian input files based on your analysis. With these tools, you easily can share your research results with others and build on the work you are doing.